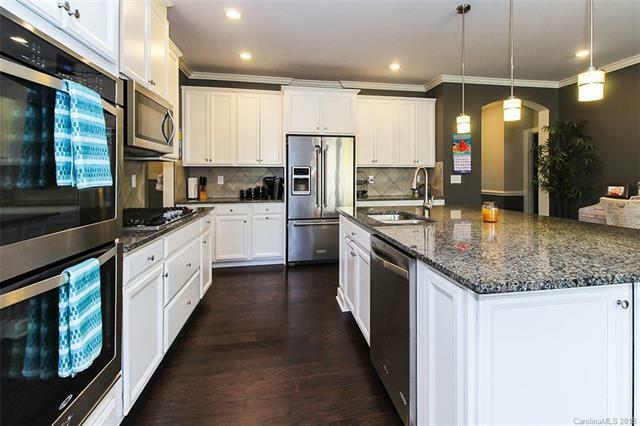 Stunning, upgraded home with the master down in the highly desirable Riverchase subdivision. Open floor plan features a dedicated office, dining room and gourmet kitchen with 5 burner gas cooktop and stainless steel appliances, double wall oven, oversized, granite island and tile backsplash. Professionally designed upgrades including built-ins, mudroom/dropzone, laundry room, extensive trim and molding, custom paint palette thru-out the home. Large backyard with extended patio and fire pit and stone accent wall that is perfect for entertaining. This home will be zoned for the brand new Catawba Ridge High School. Sold by Erica Homes Llc. The data relating to real estate on this Web site derive in part from the Carolina Multiple Listing Services, Inc. IDX program. Brokers make an effort to deliver accurate information, but buyers should independently verify any information on which they will rely in a transaction. All properties are subject to prior sale, change or withdrawal. Neither Carlyle Properties nor any listing broker shall be responsible for any typographical errors, misinformation, or misprints, and they shall be held totally harmless from any damages arising from reliance upon this data. This data is provided exclusively for consumers' personal, non-commercial use and may not be used for any purpose other than to identify prospective properties they may be interested in purchasing. © 2019 Carolina Multiple Listing Services, Inc. Data last updated 2019-04-25T14:59:11.49.